This coconut chocolate bark is, to put it simply, a revelation. And like most revelations, it started out with humble beginnings. With a very utilitarian purpose. I was simply looking for new ways to incorporate coconut oil into my diet. You see, in addition to all the benefits of coconut oil (which my nutritionist pal Joy has summarized beautifully in this post), it is also known to be a very healthful choice for people with gallbladder disease…which I have and have had since the age of about 8. I haven’t mentioned this on the blog before because it seems like a total overshare, but I thought I’d say something now in case there are others out there who suffer from the same thing. And no, gallbladder disease is not something that only affects people who are overweight or over 50. Young’ins like me can be susceptible too for a wide variety of hereditary reasons (in my case a rare blood disorder). Represent. So how does coconut oil help? Well, a doctor told me recently that coconut oil is unique because, unlike other fat sources (even healthy ones), it avoids your gallbladder entirely. That’s good news for everyone, not just gallstoney weirdos like me, because it is converted to usable energy very quickly leaving you feeling satisfied and energized, without the sluggish feelings that can sometimes accompany a high-fat meal. Universal win. So let’s get to it, shall we? Vegan, Grain-Free and pretty much everything-friendly. Combine all ingredients except vanilla and coconut in a small microwaveable dish and heat in the microwave for about 30-45 seconds or until just bubbling. Transfer to a small freezer-friendly container, lined with saran wrap. I used a pie plate. Spread the mixture out thinly and pop into the freezer for 10-15 minutes or until set. 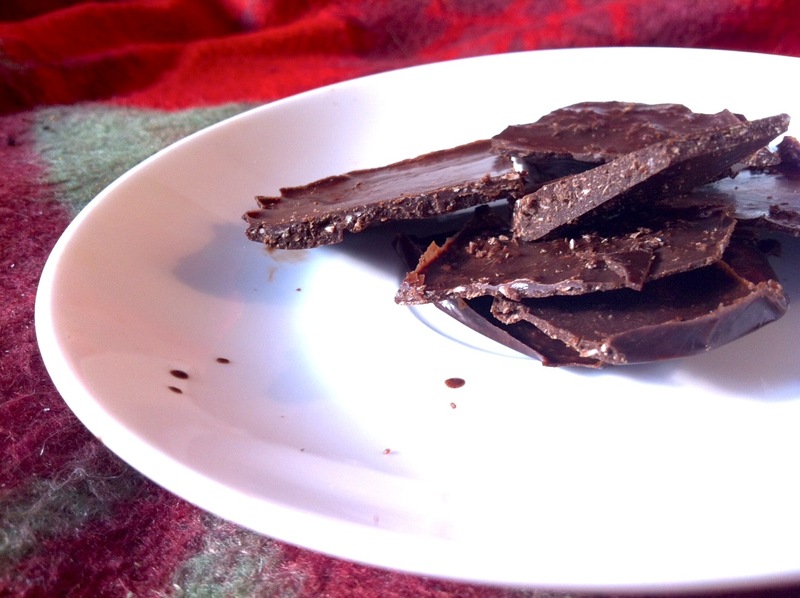 Remove chocolate bark from freezer and slice into 12 pieces. Store in the fridge to avoid melting. Nutrition facts: Around 50 calories/serving. 5 g healthy fats. 1.5 g protein. I enjoyed 2 big pieces (plus many spoon/bowl licks) as part of my breakfast this morning. Delicious. Hope you enjoy this recipe as much as I did! i need to get more coconut oil – looks delicious! Yum. Love the shredded coconut addition!